After more than three years trying to drill down to the truth in Vancouver, I found the iPads at the McMichael Canadian Art Collection north of Toronto offered relief – if not quite the revelation I have been seeking. Since early 2015, I have tried to get to the bottom of a mystery arising from a donation to the Vancouver Art Gallery of 10 oil sketches attributed to Group of Seven member J.E.H. MacDonald. The VAG announced the donation with great fanfare in January of that year – explaining that the “newly discovered and never-before-displayed oil paintings” had been buried for more than 40 years at the property in Thornhill, Ont., where MacDonald lived. “Following a remarkable history, 10 rare artworks will be made accessible to the public for the first time since their creation,” the news release stated. J.E.H. 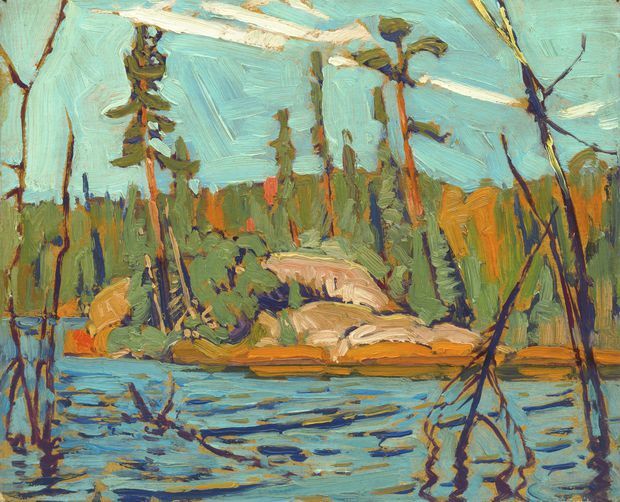 MacDonald's Moose Lake, Algoma,1920, oil on paperboard. Now, to Kleinburg, where the McMichael’s exhibition J.E.H. MacDonald: Up Close features more than 75 works by the painter and offers a fascinating, forensic window into his process – thanks to the CCI. Five years ago, the McMichael and the CCI began an in-depth conservation survey of MacDonald’s works. Thirty-two works from the McMichael, the National Gallery of Canada and the Art Gallery of Ontario including 21 oil sketches and 11 larger paintings were examined. The goal was to uncover information about how MacDonald created his work, including his choice of materials and painting techniques. Paint samples were put under the microscope; paintings were examined with ultraviolet illumination; chemical analysis was performed. At the exhibition, iPads are installed next to a number of MacDonald works. Swiping through the findings, you see magnified cross-sections and microscopic images blown up to reveal details in the board, pigment dispersion, composition structure, brushstroke patterning and more – along with simple, layperson-friendly explanations. The Canadian Conservation Institute survey of J.E.H. MacDonald's work found that the artist came to prefer using a lightweight bookbinding board, which eased the load while travelling out in the wildernessm as he would have done during his Algoma period, producing work such as Moose Lake, Algoma. Au contraire: The window into these findings was illuminating; the transparency, refreshing. After years of unsuccessfully trying to find out what the CCI had discovered about the MacDonald paintings acquired by the VAG, here in full colour was what the CCI had discovered about paintings known to be by him. 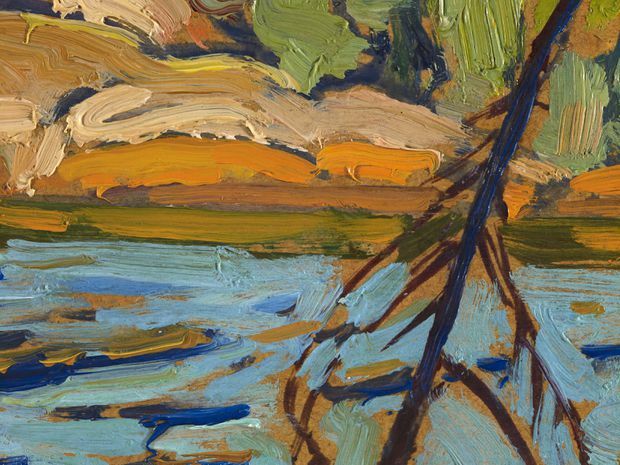 The McMichael/CCI study reveals a maturation of MacDonald’s process – from laboured paint application in his early works to multilayered, wet-over-wet brushstrokes, to more directional brushstrokes. The research identified favourite pigments – and showed that MacDonald rarely used black. The study also found that MacDonald grew to prefer a lightweight kind of bookbinding board to ease the load when transporting equipment out into the wilderness, as he did in his seminal Algoma period. “There’s no kind of Dan Brown discovery here,” Dejardin says, referring to the author of The Da Vinci Code. After returning from Kleinburg, I contacted the VAG again to inquire whether there were any updates regarding the paintings and repeated my request to see the CCI findings. The VAG – a public institution funded in part by taxpayer dollars that is currently trying to raise money for a new, purpose-built gallery – re-sent me the same statement. Despite initial promises to make the paintings accessible, they have yet to be publicly displayed.